Vlando Wooden Jewelry Box, Jewelry Organizer and Storage- Grey | What Should I Say? Huge Savings Item! Free Shipping Included! 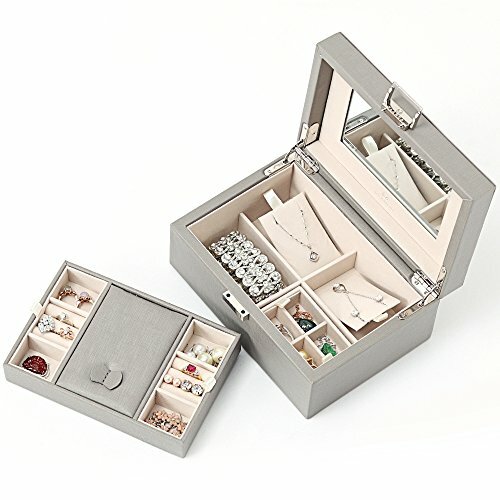 Save 19% on the Vlando Wooden Jewelry Box, Jewelry Organizer and Storage- Grey by Vlando at What Should I Say?. MPN: V16002-03. Hurry! Limited time offer. Offer valid only while supplies last. Vlando's Story VLANDO is an inspiring brand revived by Dutch designers with a long history of quality fine home and office products and solutions. VLANDO Pandora is a medium sized jewelry boxed designed to store your favorite accessories. SPECIFICATIONS: L 8.3 x W 6 x H 4 inches. MATERIALS: Made from durable synthetic leather and a velvet lining, the Pandora has a unique style, concealing all your accessories. INCLUDES: The lid contains a large mirror while the upper level has 4 ring holder slots, 4 small compartments and one large closing compartment in the middle. Lift the upper level to uncover a secret space with up to 7 more storage spaces offering space to store your rings, earrings, chain necklaces, small watches, thin bracelets and cuffs. GIFTING: Delights those who receive it as a present.